When we previously talked about how to write a white paper, we looked at the ways informational reports can be used as highly effective marketing tools. Marketing case studies are another popular informational marketing tool you can use to promote your business. You might have in-house marketing folks write your case studies or you might hire a freelancer to help you out. But if you want to give it a try on your own, this article should get you moving in the right direction. There are different types of case studies. For the purpose of this article we’re talking only about “marketing case studies.” A marketing case study is kind of like your company’s chance to play show-and-tell with your customers, prospects, and the public. A case study is a document that details a very specific success you’ve seen — either on your own behalf or on the behalf of a client. For example, an SEO firm might publish case studies relating to individual clients and past projects such as showing a struggling client achieving first placement search engine rankings as a result of the firm’s search engine marketing plan and implementation. Problem – Your marketing case study should start out by highlighting a business problem you or a client had. It should be a problem that other customers or prospects can relate to, or something that might interest the media if you plan to use them as background material for newsworthy stories you intend to pitch. Approach / Solution – Next you’ll cover your plan or approach — how you intended to address the problem. You should briefly explain why you chose the approach that you did and how the problem can be solved using that approach. Results / Evaluation – Then you’ll want to share specific results proving that your approach and intended solution worked in a real-life scenario. You might also offer further evaluation of the approach if you think it’s needed. Attract more clients or customers when they see the real-world impact you, your products, or your services can have. In the end, case studies help you prove the value of what you offer in a very specific and measurable way. You may remember that white papers work using a similar formula — problem, general solution, your solution. The biggest difference is that while a white paper can educate your prospective buyers in a longer format, these generally shorter case studies are more about illustrating something specific and real. You move beyond the “I can help you solve your problem by doing X, Y, and Z,” to “Here’s what I’ve already done to prove I can solve the very problem you’re experiencing.” And that can be an incredibly strong motivational marketing tool. 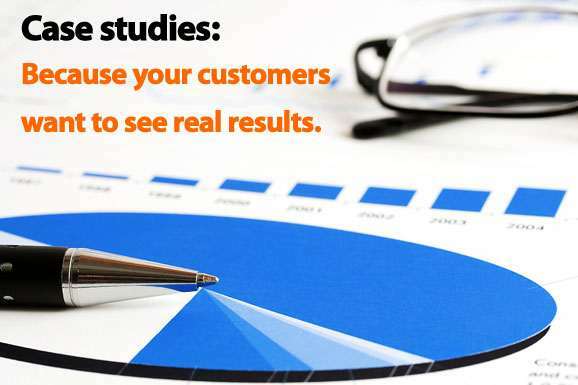 Have you used marketing case studies before? How have they worked out for you? Do you have case study writing tips you’d like to share? Please leave your thoughts, experiences, and ideas in the comments below.